The June meeting of the Central Mississippi Polymer Clay Guild will be on Saturday, June 16th, at 10:00 a.m. at the Pearl Library, Pearl, Mississippi. The topic for this meeting will be The Meeting of the Canes. Joyce will be leading this meeting. This will be a fast paced meeting so be sure to be on time so you won’t miss anything. June is also our annual membership renewal month so if you did not fill out a membership form and pay your 2018 dues already, be sure to come prepared for that. The more clay you bring, the more canes we can make. Each cane we make can use up to a whole bar of at least 2 clay colors. Must have lights and darks. You can work from the block or make your own colors by mixing. You will want some contrast so an abundance of black and white is useful. And bring at least one yellow and 3 bright colors that will go together for a fanciful fish cane. There is lots to go over for this meeting. Please make the effort to condition at least the black and white clay before the meeting. That will allow us to start on time and you will have time to condition other colors as you get caught up. The more you condition the more we can accomplish on Saturday. Reminders: The weather is getting HOT- you may want a cooler with an ice pack to transport your clay. The library has no control on the temperature in the room making it very hot at times, very cold at others. We recommend layers of clothing. The Display Case can use new items each month. Thinking this month we might go with the fairy house scheme. I'm going to make a flow chart but it would be lovely to put some done pieces in there. We have had several people visit our meetings recently. Our Guild’s policy is that a person can attend 2 meetings free. After that, people have the option to pay $5.00 per meeting or join the Central Mississippi Polymer Clay Guild. 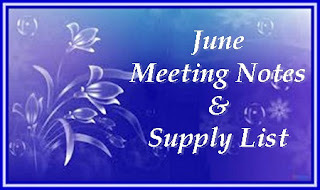 Our membership year begins in June with an annual membership fee of $20.00. The prorated new member fee is $2.00 per month, so members joining after the June meeting will pay a prorated new member fee.